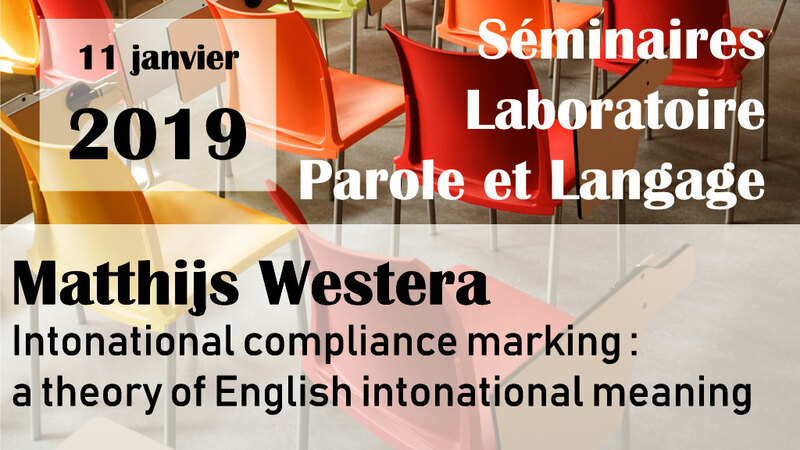 AMUpod - Séminaire de Matthijs Westera, "Intonational Compliance Marking: a theory of English intonational meaning"
Résumé Here’s a conceptually simple theory of English intonational meaning that seems to work well for a number of empirical phenomena. It’s basically the old idea that rises mean ‘incompleteness’ and falls ‘completeness’, but made significantly more precise by considering what it means for an utterance to be ‘incomplete’ or ‘complete’. I define these notions in terms of (non-)compliance with the conversational maxims. To illustate: plain rising declaratives can express uncertainty about the truth (Quality), relevance (Relation), sufficiency (Quantity) or manner (Manner) of the utterance, that is, potential non-compliance with each of the Gricean maxims. I call this theory Intonational Compliance Marking (ICM). In this talk I’ll summarize the ICM theory and its application to rising declaratives (Westera, 2018), the rise-fall-rise contour (Westera, to appear), and, time permitting, list intonation and question intonation. In each case, precision about the maxims is what makes this (at the outset) simple theory generate fine-grained predictions. I hope that this work can inspire research on intonation in English and cross-linguistically, as well as on discourse particles and on pragmatics more generally. Updated on: March 7, 2019, 11:42 a.m.